The most successful analytics projects are the ones that are closely tied to solving a business problem as opposed to merely featuring sophisticated analytics. The highly successful Orion project at UPS (featured in a recent OR/MS Today magazine article) is a stellar example of this. It has saved UPS over $300 million. Additionally, over 100 million miles have not been driven, and 10 million gallons of fuel have not been used. Numerous UPS drivers have reported the ability to service even more customers in the same amount of time. This array of cross-functional benefits reminds me of the cross-functional benefits of many company-wide sustainability efforts I have read about over the years. It used to be that sustainability efforts were primarily focused on narrow areas, most notably environment, safety, health and corporate responsibility. Now these efforts often involve many other areas, if not the entire company. One example from the pharmaceutical industry is designing a new manufacturing plant to be LEED (green building standards) certified as well as being compliant with applicable FDA Good Manufacturing Practice guidelines. Another one from many industries is the realization that redesigning packaging to be more “sustainable” can have additional benefits such as being easier to use, easier to produce, and cheaper over the long run. The fact the companies are broadly implementing sustainability is really no longer news—it is becoming part and parcel of how many are doing things. I see a similar dynamic occurring with analytics, which are quickly being integrated into a broad array of business functions beyond the “analytics department”. The explosion of available data has led to an increasing number of ways to actually use it. This has extended way beyond the “analytics group” and permeated into many levels of management. Not surprisingly, this trend has been accompanied by a vast number of universities offering new graduate certificate programs specifically in “data analytics”. I’ve seen this before—a previously somewhat isolated focus area becoming broadly accepted and implemented across a variety of business functions. It has happened with sustainability efforts over the past 10 years. It is now occurring with analytics initiatives in a parallel fashion. Since I am keenly interested in both sustainability and analytics, I am very happy to see this happening. I was enjoying some very fresh seafood on Cape Cod when a nearby sign beckoned me to recycle my oyster shells. I did not have any, but I thought the concept was very interesting. I had no idea that oyster shells could even be recycled. I have since learned that that they indeed can be. There is even an organized effort to return oyster shells (sans the recently-eaten oyster) back to the ocean they are dried and aged for about a year. This is vastly superior to sending them to a landfill. According to the Massachusetts Oyster Project, the idea is to essentially put oyster shell back into what was their native habitats. The recycled shells have chemical properties that benefit the habitats of their oceans, particularly having to do with lessening levels of acidification in the water. As extra materials on a reef, they also help build protect the shoreline by strengthening the underwater barriers that lessen the wave energy from incoming water. In addition to providing places for young oysters to grow, they also provide space for different species to live underwater. These include fish, shrimp, crab, eels, mollusks, etc. The program has been running since 2010. The news broke this week that the owner of the Chobani Greek yogurt brand (Hamdi Ulukaya) has decided to give a portion of his company’s stock to his employees via stock grants. The amount of stock granted to employees depends upon the employee’s role and seniority, with an average value of $150,000. These actually become active if the privately held company is sold or goes public. I really like this for a whole lot of reasons. The main reason is that the employees of the company (who create the bulk of the company’s value on a day to day basis) will now be able to explicitly share in the wealth that they are creating. It will definitely give the (line) employees a powerful context for what they do each day, since they will have a slice of the company, (although admittedly, not large). It is a strong affirmation of the importance of the employees to the operation. This is very important, since many companies treat employees as unit costs to be minimized. There are certainly good financial benefits for Chobani to do this. Tax write-offs, stock control, a friendly voting bloc of stock, decreased recruiting costs, potentially higher retention rates, etc come to mind. But no matter—this owner made a choice to share his wealth—and that is very cool. Let’s project, for a moment, that Chobani will join those (partially) employee owned companies that outperform their competition. If that happens, then Ulukaya’s somewhat smaller share of the company will be worth even more than his current share is. Everyone wins! According a recent National Geographic article (“Your Brain on Nature”, January 2016) there has been an increasing amount of research documenting the positive effects simply being in nature has. More and more studies and experiments are reporting an association between being in nature, or otherwise experiencing nature, and lower levels of stress. These studies and anecdotes come from around the world. The general theme of these studies is that experiencing nature can lead to demonstrable decreases of stress-producing hormones. In the other words, the environment can make us healthier—if we choose to let it do so by valuing and preserving it. This is an interesting parallel to a perspective that incorporates sustainability into one’s life or business. Sustainability implies a concern or a care for the environment. In one context, it is using economic decisions to lessen (or minimize or eliminate) stress on the environment. For example, buying a product made from recycled material incurs far less environmental costs than buying new. Or, products made with environmental sensitivity (organic cotton) use less environmental resources than others, say, regular cotton. I think it is interesting how we can take care of our environment through our daily decisions, and the environment, in a very broad sense, can take care of us. That is a great example of mutual assured well-being! I was somewhat surprised to read in my latest Nature Conservancy magazine about a joint effort to record data about usage of the ocean. The effort, called the Mid-Atlantic Ocean Data Portal, is an attempt to collect a myriad of data about all kinds of uses of the oceans off the Mid-Atlantic coast. For this data portal, the Mid-Atlantic is broadly defined as Virginia, Maryland, Delaware, New Jersey, and New York. Even the earliest stages of the data show that there is a surprising amount of interdependencies amongst the various uses of the Mid-Atlantic oceans. Some of the specific types of data included in this are fish catches, port activity, recreational usages, boating channels, beach tide levels, reef locations, renewable energy analyses, etc. This is a list of usages that are not always in the same sentence, much less the same database—but they are in this one. Hopefully, this variety of data can help provide a wholistic look at the ocean and how it is used. This is most likely the first time that it will be possible to find such a variety of perspectives in the same database. I think this will allow for a broader conversation on how these uses interact with each other. Aiding this conversation is the data visualization component of the data. For example, one can see how optimal sitings for wind turbines compare with fishing yields. Or, how recreational boating patterns compare with concentrations of various marine life. The net result will be more informed decisions on how to manage the MId-Atlantic oceans for the optimal benefit—of the oceans overall and of each of the various usages within them for long term benefit. This comprehensive approach portends well for a sustainability perspective. It enables policy makers and stakeholders to make decisions based on an overall view of the oceans as a system with interdependent components. That is an exact parallel to sustainable systems thinking, which encourages users, businesses, anyone, actually, to make decisions not just on their specific interest, but with consideration of how their decisions impact a broader whole. Hopefully, it will help support the long-term viability of these oceans for many uses—economic, environmental, recreational, and more. Last week, the Supreme Court upheld the Federal Energy Commission’s (FERC) Order 745, which had been effectively in limbo for the past couple of years. This order had been the legal basis for expanded demand response activity. Demand response is the array of programs whereby an end user (me, a business, a factory) agrees to reduce their electricity usage when the system operator needs it. Often, it is matter of cycling groups of users “off the grid” for a short time. Taking groups of users “off the grid” for a few minutes can have a surprisingly powerful impact in terms of stabilizing the electricity marketplace. In return for NOT demanding electricity at specific times, these end-users get compensated for the amount of electricity they did NOT use. Actually determining how much electricity someone did not use can get a little tricky, but the concept still applies—conservation of power is compensated just as the generation of power is compensated. In fact, it is not uncommon for the unit price of this compensation to be the same in both instances. This unit price is the Locational Marginal Price per kilowatt hour. My personal image of demand response is the $20 monthly credit I get from PECO in return for allowing them to cut off my air conditioner for up to 15 minutes at a time during the hottest of summer months. My house can heat up, but it won’t heat up that much in 15 minutes. So, I am OK with this. Residences such as mine were about 15% of the demand response activity in 2014 and 2015. Office buildings and schools were each just shy of 10%. The biggest single sector by far was the industrial manufacturing sector, which accounted for nearly half (50%) of 2015 demand response activity. As it happens, by virtue of my residence near Philadelphia, I am in the PJM Interconnection zone. PJM is one of the more advanced ISOs when it comes to demand response. Depending upon which specific transactions are included, PJM reports in the neighborhood of $8-10 million in demand response activity in 2015, affecting several hundred million megawatt hours. Many methods including HVAC, lighting, manufacturing operations, and using generators are all acceptable demand response tools. I am glad that the Supreme Court upheld Order 745. It had led to a vast expansion of demand response activity; PJM has stated that within the first market (demand) year after FERC issued Order 745, demand response volume equalled what had been achieved in the previous 5 years combined. That is a big impact. Now that the rules have been settled for demand response moving forward, hopefully it will expand again. Not only will electricity demand be reduced, but price volatility can be lessened if not largely eliminated on excess demand days, which can potentially occur year round. That is a true economic and environmental win-win. The National Parks have had a long-standing interest in implementing sustainability initiatives. In previous years, for example, the parks put into the place the “Healthy and Sustainable Food Initiative” by increasing the amount of locally sourced food at its concessionaires. In 2015, the Park Service decided to address a different sustainability challenge–the 100 million pounds of trash generated each year by park visitors. They have done this by cooperating with several organizations to make the National Parks Zero Landfill spaces. These organizations include Subaru, the National Parks Conservation Association, and the National Parks Foundation (I donate to the latter 2). Subaru is a logical partner for this effort due to its experience with its zero landfill factory in Lafayette, Indiana. The program has begun with pilot projects at 3 iconic parks: Yellowstone, Grand Teton, and Denali. These three parks alone account for 16.6 million pounds of waste annually. Of this amount, about 6.9 million pounds are diverted from the landfill–the question is how to keep the other 9.7 million pounds out of the landfill as well. The first step is for the National Parks Conservation Association to review the current practices in these parks in terms of recycling, composting, and waste reduction efforts. Subaru’s factory experts on “zero-landfill processes” will also visit these parks. The insight from these assessments will give the park service insights on how to reduce the amount of waste that needs to be landfilled, with the goal of zero waste at all being landfilled. That is the goal, at least. Whether this effort will truly result in absolutely zero materials being sent to the landfill is an open question; however in all cases, the idea is to have the National Park Service send nothing, or almost nothing, to any landfill–first at these 3 parks, and then hopefully at all of the nearly 300 units in the National Park system. The Plan attempts to deal with many issues currently affecting Pennsylvania State Forests. A sampling of these includes (but is not limited to): the increase in fracking for natural gas, more public attention to sustainable forest management, climate change, recreational uses, new disease threats, the importance of social media, long-term timber production, cultural and historic resources, and a forest inventory. Before I read through this, I had no idea that almost all of today’s state forests were barren land a century ago, or that the state forests are certified by the Forest Stewardship Council (and audited every 5 years). Nor did I know that the state works with Penn State to develop an optimization model to balance near term wood product harvesting demand with long term forest vibrancy. In fact, one of the original purposes of creating state forests was to enable a long term supply of various wood products from Pennsylvania. This certainly implies that long term sustainability of that supply is a top concern. On the other hand, extraction industries (coal, oil, and natural gas, especially fracking) are not operated with the goal of maintaining environmental health; they often need an environmental mitigation component. Naturally, the less of these in the forests in the first place, the less environmental mitigation required. One of Gov. Wolf’s first actions in office was to put an immediate stop to new leases for Marcellus Shale gas–but many remain active on the books. As an avid hiker, the main thing I think about in terms of the (state) forest is the network of trails. That is “recreation” in the forest for me. Surprisingly, a major recreational use of the state forests is simply taking a scenic drive. Hunting, camping, canoeing, kayaking are on the list as well. I had no idea how dynamic the state forests truly are. This dynamism comes out in the plan. It is worth taking some time to become educated on what is going on in the forest(s). 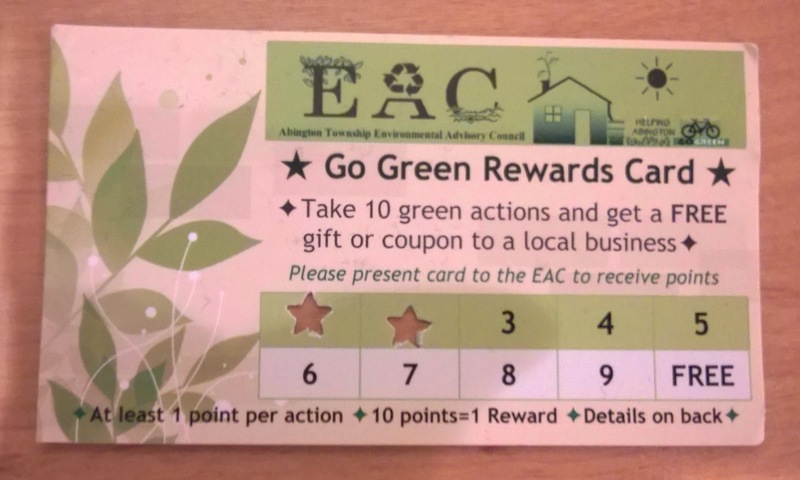 The Go Green Rewards Card, a program of the Abington Township Environmental Action Committee, is a twist on customer rewards programs. This rewards card supports both the environmental and economic aspects of sustainability. If you take part on specific environmental activities, you get points that you can use at local businesses. Examples include attending a rain barrel workshop or an energy savings expo, volunteer for the EAC, make your yard an Audubon Bird Habitat. The emphasis on local businesses is a nice way to encourage residents to patronize business in their community.